Our In Loving Memory Memorial Wood Picture Frame makes a beautiful Memorial Keepsake to honor your deceased family member or close friend. We will engrave this picture frame with any name you choose. Great sympathy gift to remember your loved one. These frames are very nice & good quality. I have bought tons of shirts, sweatshirts and now 3 frames. Everything is well worth the money. I just love this site. GiftsForYouNow.com specializes in loving Personalized Memorial & Sympathy Gifts. 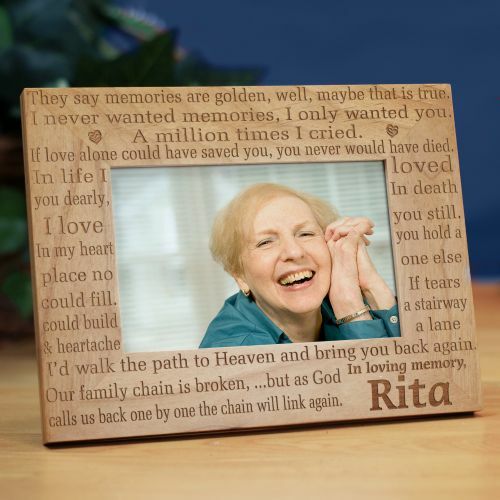 Shop for more memorial picture frames to display your favorite photo of a loved one.